"An immensely entertaining novel" (Tor.com) from the author of The Thousand Names... The King of the Vordan is on his deathbed. Soon his daughter, Raesinia will be the first Queen Regnant in centuries--and a target for those who seek to control her. The most dangerous is Duke Orlanko, Minister of Information, and master of the secret police. He is the most feared man in the kingdom, and he knows an arcane secret that puts Raesinia completely at his mercy. But Raesinia has found unlikely allies in the returning war hero Janus bet Vhalnich, and his loyal deputies, Captain Marcus d'Ivoire and Lieutenant Winter Ihernglass. As Marcus and Winter struggle to find their places in the home they never thought they would see again, they help Janus and Raesinia set in motion events that could shatter Orlanko's powers, but perhaps at the price of throwing the nation into chaos. But with the people suffering under the Duke's tyranny, they intend to protect the kingdom with every power they can command, earthly or otherwise. 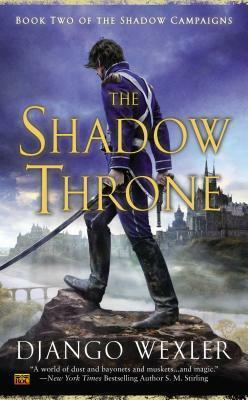 Django Wexler is the author of the Shadow Campaigns novels, including The Infernal Battalion, The Guns of Empire, The Price of Valor, The Shadow Throne, and The Thousand Names. He graduated from Carnegie Mellon University in Pittsburgh with degrees in creative writing and computer science, and worked for the university in artificial intelligence research. When not planning Shadow Campaigns, he wrangles computers, paints tiny soldiers, and plays games of all sorts. He is also the author of the middle-grade fantasy novels The Forbidden Library, The Mad Apprentice, and The Palace of Glass.